a large variety of wines, which are so amusing to taste. 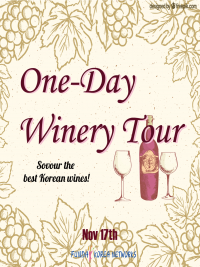 process of producing Korean wine. 대부분의 사람들은 한국이 질 좋은 와인을 대량으로 생산한다는 사실을 모르고 있습니다. 제조 과정을 배우며 와이너리 투어에서 즐거운 시간을 보냈습니다.